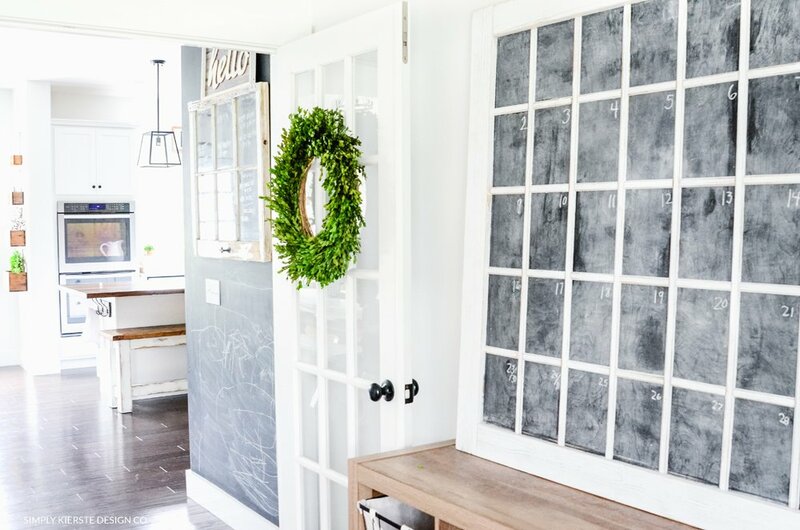 Have you ever seen a really cute chalkboard window and though to yourself how you’d love to have one…if only you could find just the right window? Well, you don’t have to wait anymore! 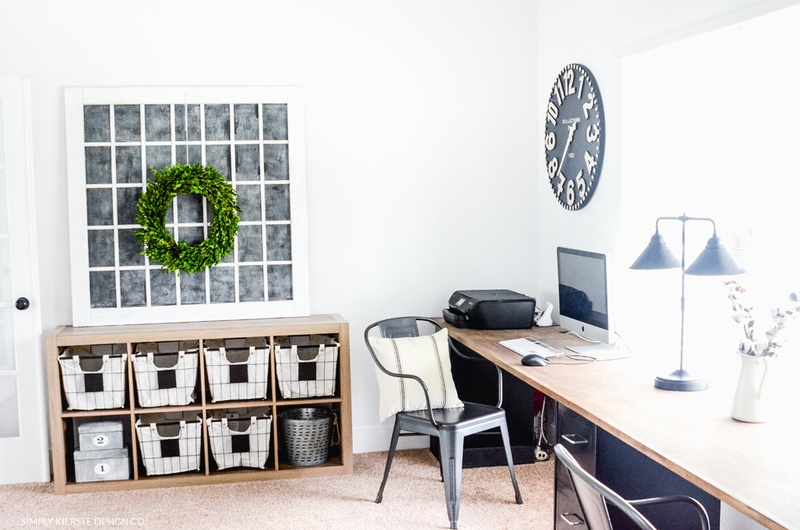 I specifically wanted to create large chalkboard calendar that would fit an entire month, but after searching for literally years for the right window (that was either free or cheap), I was still empty-handed. All of a sudden it hit me…why don’t you make your own? So I did. 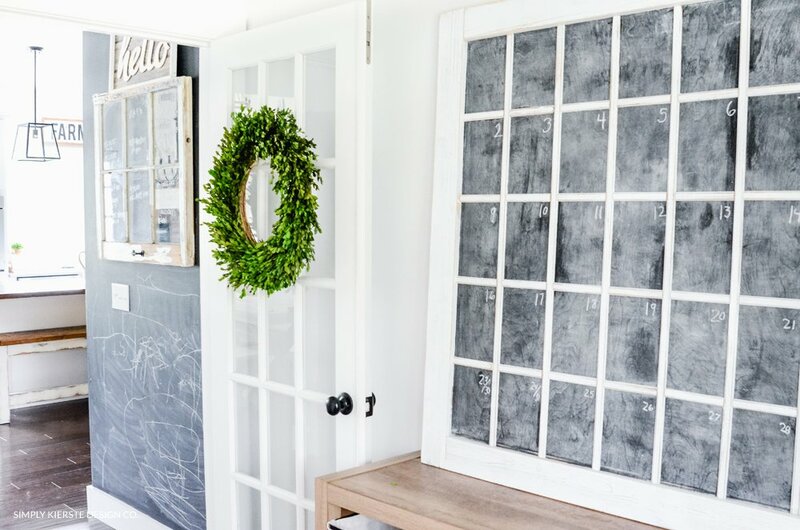 Enter in my DIY Faux Chalkboard Window! 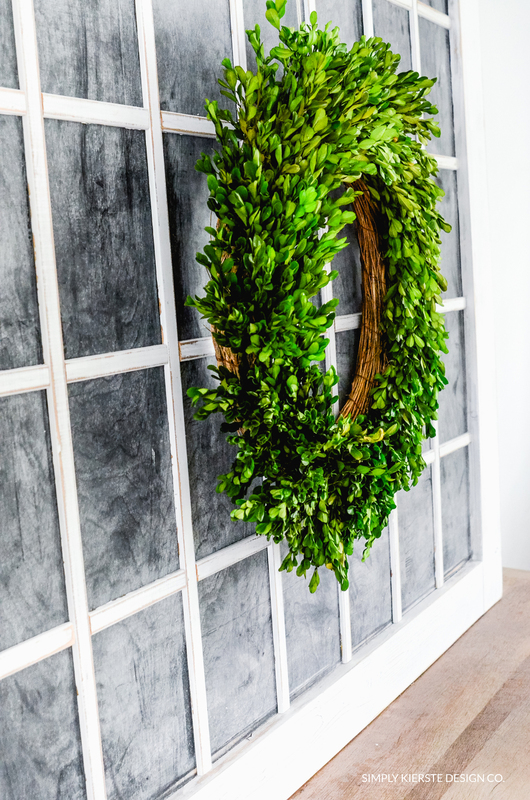 I absolutely love it in my office, and I like it so much with just the wreath, that I haven’t actually started to use it as a calendar. Yet. But I think when school starts might be the perfect time! 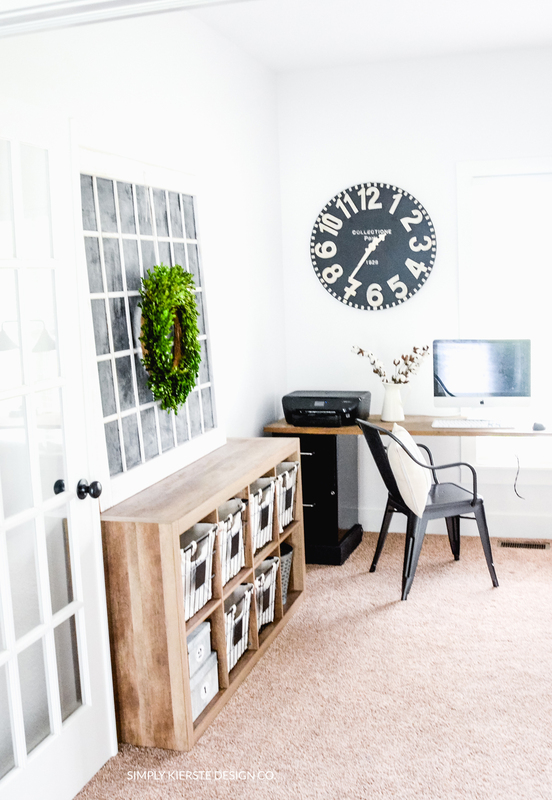 Either way, it’s super cute, and the full of farmhouse style and charm. -Cut the plywood to size. Paint on 2 coats of chalkboard paint, and let dry completely. 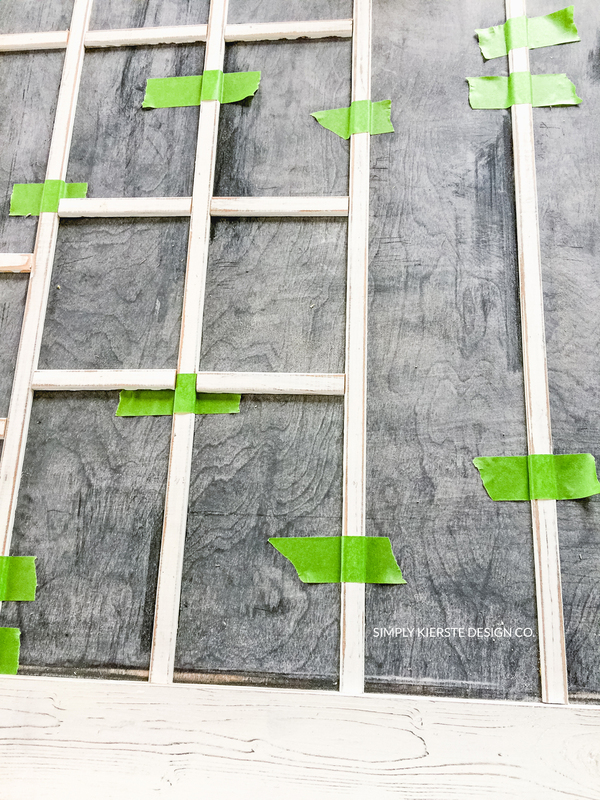 –Cut the 1×4 boards to fit around the plywood. -Stain first, if desired, then paint and let dry. Use a sander to distress the edges. You can also skip the stain and just paint if you want to! -Stain, paint, and distress your moulding at the same time. About the moulding: Home Depot sells the moulding by the linear foot, so you can just cut off what you need. They usually stock them in 12 and 16 foot lengths. It’s pretty inexpensive, and I would buy some extra just in case. You will need to calculate this out before you head to the store to make sure you have the right amount. 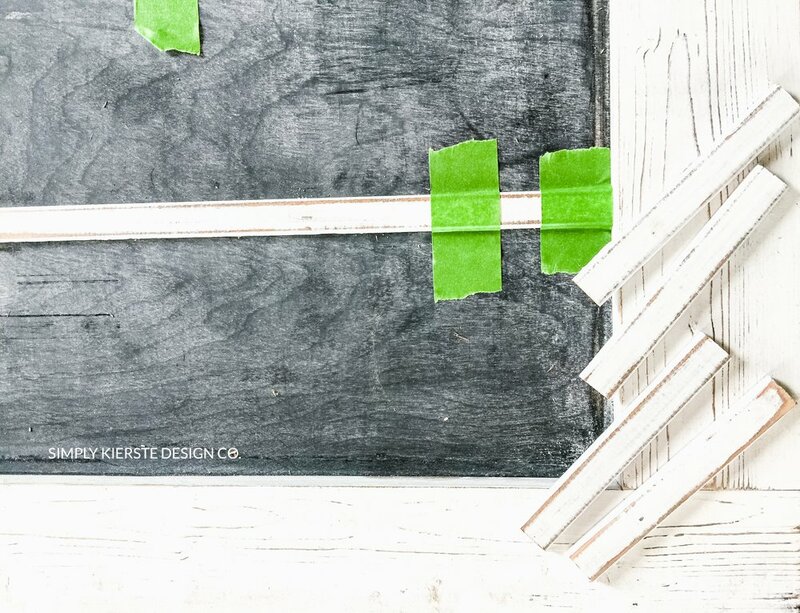 Measure or calculate the inside chalkboard area. (Plywood size minus the frame around the edges. For example, if your plywood is 60 inches x 60 inches, and you use 1x4s around the edges, then the space inside will be 53 x 53.) I knew I was going to have 5 horizontal rows and 7 vertical rows, since I intended to use it as a calendar. (You don’t have to do that way–you can make them smaller, larger, whatever you like!) Once I had the size of the space and the amount of rows, I could calculate how much moulding I needed to buy. 5 horizontal rows is actually only 4 pieces of moulding, and for the 7 vertical rows I needed 6 pieces. I multiplied those numbers by 53, then divided by 12 to get the feet. -Adhere the full moulding strips going vertically first, using SUPER GLUE. 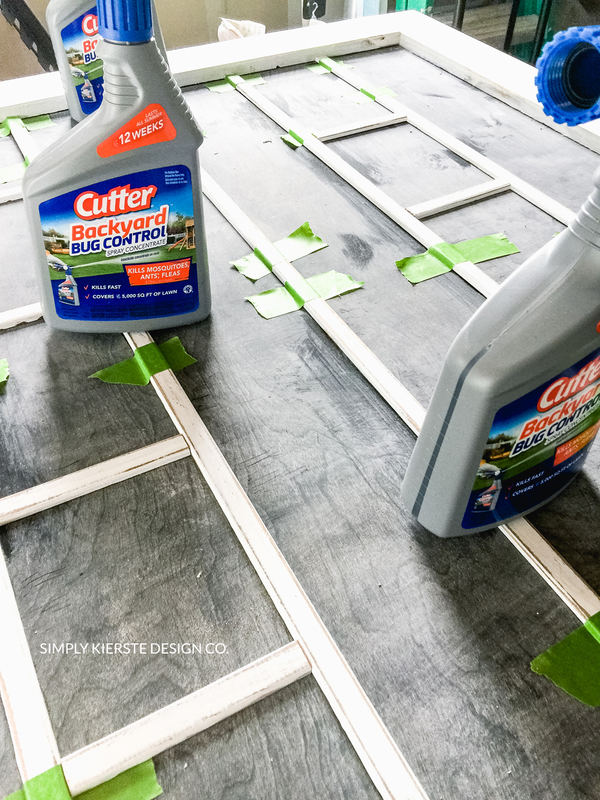 If you use wood glue, you run the risk of the moulding slipping before it’s dried, especially with all of the other working you’ll be doing right around it. Super glue dries much faster, making the job that much easier. You do have to be extra careful though, to put them in the right place, because it does dry so quickly. From that we knew that each square, and each horizontal moulding piece needed to be 6.825 inches in width. Ta-da! We knew that we would space the horizontal rows 10 inches apart. We made a block of wood that was 6.825 x 10, and then all we had to do was put the block down where the square was supposed to be, and lay down the piece of moulding, glue it down, move the block down, then repeat. It made it so much easier! -We used painters tape to secure the pieces, even though we had glued them down, and then put something heavy on top of them while they dried. Just some extra precaution after all that work! 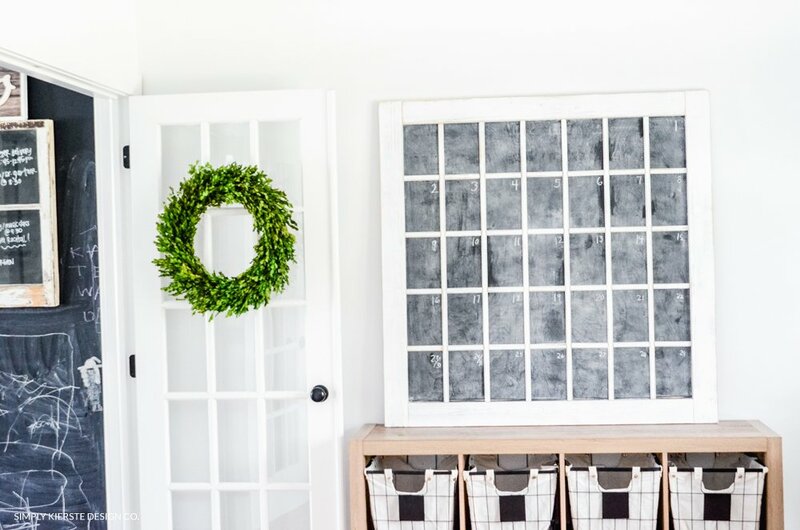 Once the glue is dry, you’re finished, and you’ve got an adorable DIY Faux Chalkboard Window, perfect for so many places in your house. You can make it any size, so fit any space, and that’s the beauty of this project. 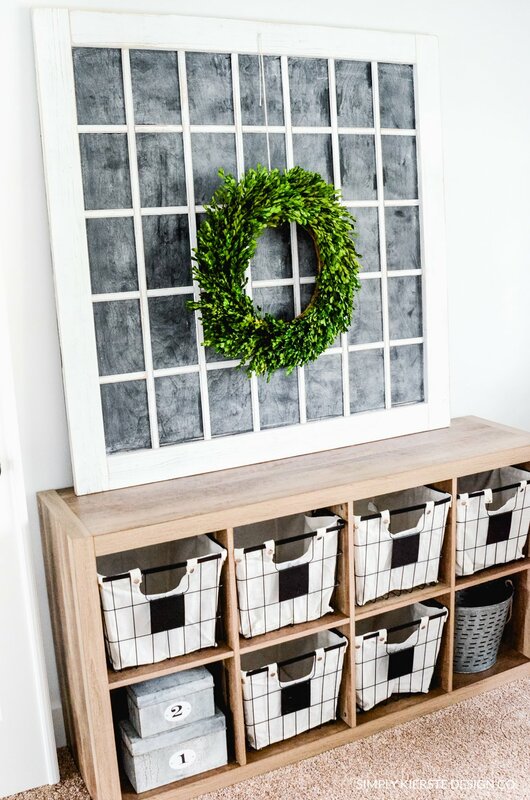 No more waiting for the perfect window…just make your own! I LOVE LOVE mine, and it was totally worth the process.